Very sturdy, modern, chairs. Time will tell how well they hold-up, but they seem like higher quality than most. Chairs also arrived put together which is a big win. Ideal for Home and Office Use - Living Rooms, Dining Rooms, Bedrooms, Nurseries, Waiting Areas, Parties, Banquets, Work, Small Space etc. Available color: Black, Natural, Orange, Red, Walnut, White. Please check with our 2xhome store for more details. Beautiful chairs that are light weight but look are also great quality. They look great around my white dining table. I got these to replace fabric chairs that were hard to upkeep with pets and children, and these look like they wipe easily as well. Absolutely love them. Came assembled. Loved the wood grain and natural feel. Just as pictured. These chairs are great. Wood frame is durable and the design is very comfortable. I’m adding a faux fur throw over them, to give them a chic look, which makes them look extremely expensive. Excellent purchase. 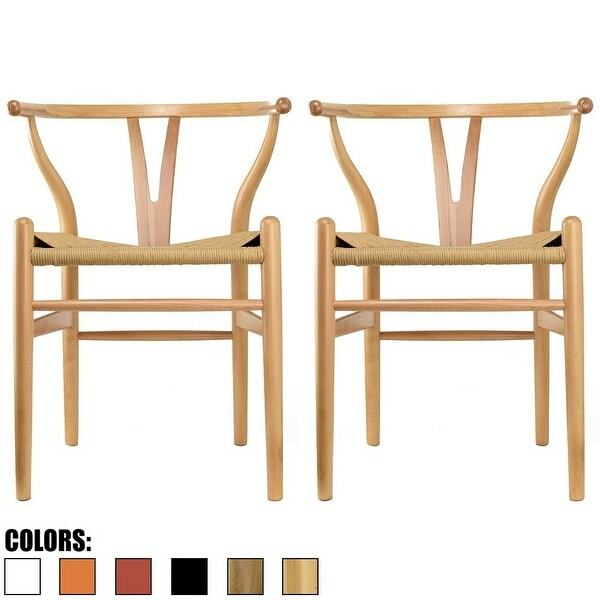 We ordered this set of arm chairs….. and they are gorgeous ... beautiful and more than what we expected! it provided the touch I was missing on my décor...! love it..! Love these chairs. They come fully assembled and are packed very well, each in its own box. They are very comfortable and look great around my butcher block kitchen table. Got these chairs to finish a remotely project very pleased we'll built. I love these chairs! They are great quality and really good looking. They also aren’t too bulky and are leightweight. Exactly what I was hoping for when I bought them. These chairs are well-made and sturdy. Also, very comfortable and look great! I love them and will be buying more! "what is the seat height? and do you have anything in a a counter stool option that might compliment this?" Seat Height is 17.75 inches to 18 inches. We do not have a counter stool version of this (Higher Seat Height) version of this chair unfortunately. "What are the exact dimensions of the chair?"